The first three chapters are dedicated to the basic skills needed to effectively use Stata: loading data into Stata; using commands like generate and replace, egen, and sort to manipulate variables; taking advantage of loops to automate tasks; and creating new datasets by using merge and append. Baum succinctly yet thoroughly covers the elements of Stata that a user must learn to become proficient, providing many examples along the way. Chapter 4 begins the core econometric material of the book and covers the multiple linear regression model, including efficiency of the ordinary least-squares estimator, interpreting the output from regress, and point and interval prediction. The chapter covers both linear and nonlinear Wald tests, as well as constrained least-squares estimation, Lagrange multiplier tests, and hypothesis testing of nonnested models. Chapters 5 and 6 focus on consequences of failures of the linear regression model’s assumptions. Chapter 5 addresses topics like omitted-variable bias, misspecification of functional form, and outlier detection. Chapter 6 is dedicated to non-independently and identically distributed errors, and it introduces the Newey–West and Huber/White covariance matrices, as well as feasible generalized least-squares estimation in the presence of heteroskedasticity or serial correlation. Chapter 7 is dedicated to the use of indicator variables and interaction effects. Instrumental-variables estimation has been an active area of research in econometrics, and chapter 8 commendably addresses issues like weak instruments, underidentification, and generalized method-of-moments estimation. In this chapter, Baum extensively uses his wildly popular ivreg2 command. The last two chapters briefly introduce panel-data analysis and discrete and limited-dependent variables. Two appendices detail importing data into Stata and Stata programming. As in all chapters, Baum presents many Stata examples. 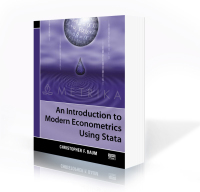 An Introduction to Modern Econometrics Using Stata can serve as a supplementary text in both undergraduate- and graduate-level econometrics courses, and the book’s examples will help students quickly become proficient in Stata. The book is also useful to economists and businesspeople wanting to learn Stata by using practical examples.